But the other days I got lucky, after a short and unplanned visit to the Turkish supermarket, and I came back with a bag full of these delicious beans. They’d better refill the fava beans supply, as I’m coming back tomorrow for more! 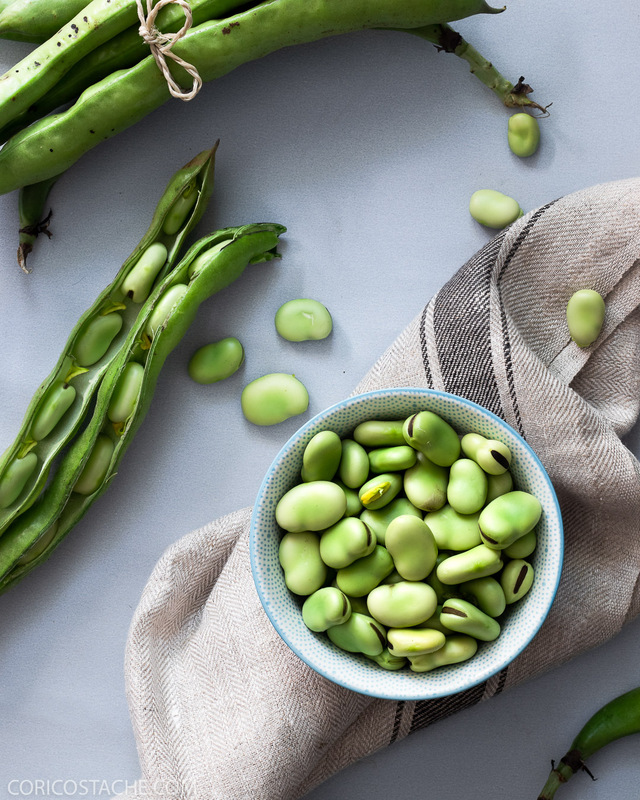 These fava beans are a treat not be missed when you spot them at the farmers market, for the season is so short, that you might just be at the tail end of it and you won’t even know it. 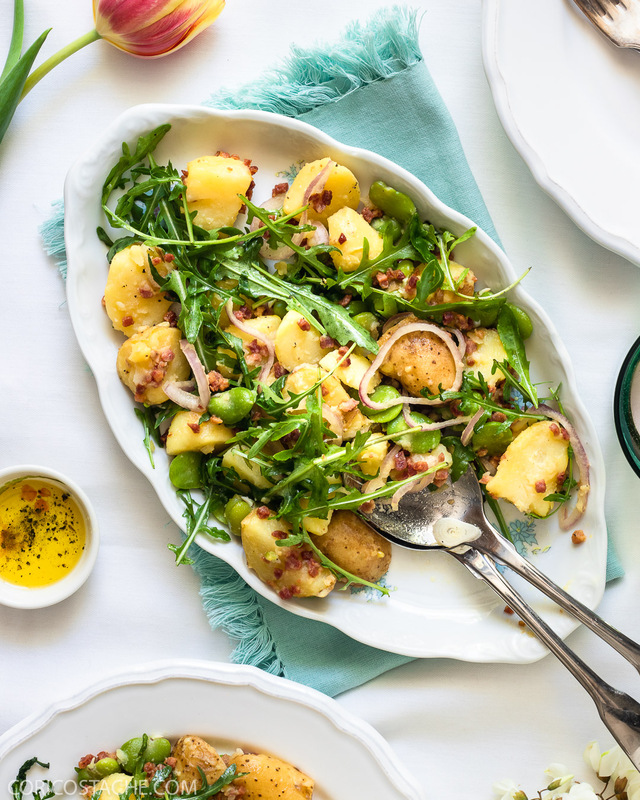 So don’t miss a chance when you find them, as they can make a dish from ordinary to extraordinary, like this Fava Beans and New Potatoes salad with Bacon and Arugula. Yummyy! 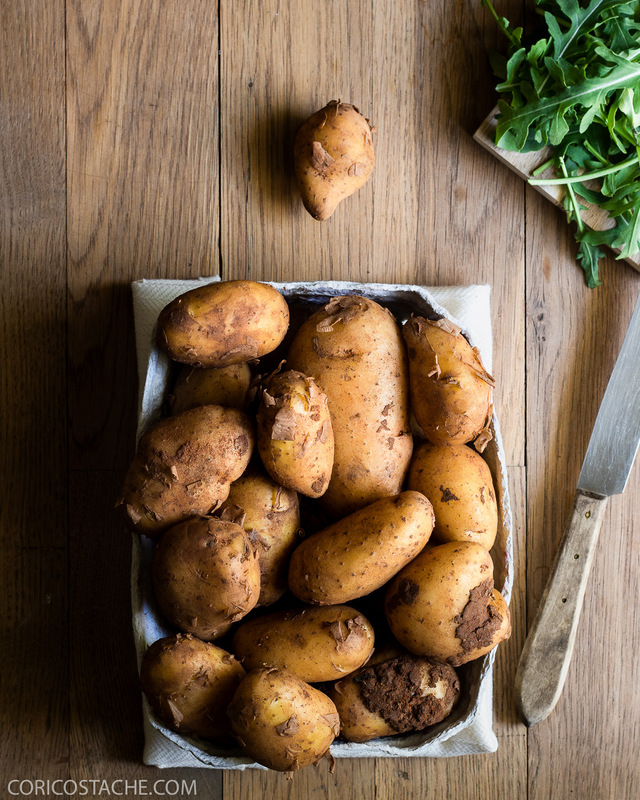 New potatoes, with their waxy texture, are sweeter, as the sugar has not converted yet to starches, therefore they keep shape after cooking, which makes them perfect for salads. You don’t need to peel the new potatoes, as the skin is so thin, it will probably fall apart when you wash them. I used a vegetable brush under running water to remove the dirt and parts of the skin, but a blunt knife will do the work too. The shallot I used was a bit too pungent for my taste, as I wanted the salad to be milder, and not completely covered by the onion’s flavor, so I marinated it for 15-20 min, whilst the fava beans and the new potatoes were cooking. All you need to do is to soak the sliced onion in lemon juice or vinegar with a pinch of salt. All the spiciness will now be tamed and you got yourself a pre dressed onion ready to be used in the salad. I wrote a bit more on this in here or you can read Samin Nosrat’s book about Salt, Fat, Acid, Heat. Remove the fava beans from their pods. Drop the beans in a pot of boiling water for 30 sec. Drain and using your fingers, remove the outer shell from each bean. You will have around 300-350 gr fresh beans. Add them back into the pot, cover with warm water and cook them for about 15-20 min, or until they become tender, but not mushy. Wash and dice the new potatoes and cook them in a separate pot with plenty of cold water and 1/2 tsp of salt. Boil them until they become tender, or when you can pierce them with a fork, about 15-20 mins. Drain the potatoes and shake them to evaporate any excess of water. In a cast iron skillet, fry the bacon, for about 5-7 mins, until it gets crispy and golden brown. Place the bacon on a plate on top of a paper towel. For the recipe I used pre diced bacon, which was definitely easier to cook and very suitable for my salad. Slice the onion and marinate it for 15-20 min. For the salad dressing, mix the oil, lemon juice, salt and pepper. Shake it well and leave it aside. Toss the new potatoes, fava beans, bacon, arugula and onion with the vinaigrette and serve with a good cold rose wine.